Snow is on the ground in Animal Crossing: Pocket Camp (Free), and with the new season comes new winter-themed villagers and Fishing Tourney #9 awarding snowpeople decorations with a familiar twist. The Toy Day Decor event is ongoing, as is the most recent (although that ends tomorrow), so there are lots of rewards to earn by playing into these (holi)days. 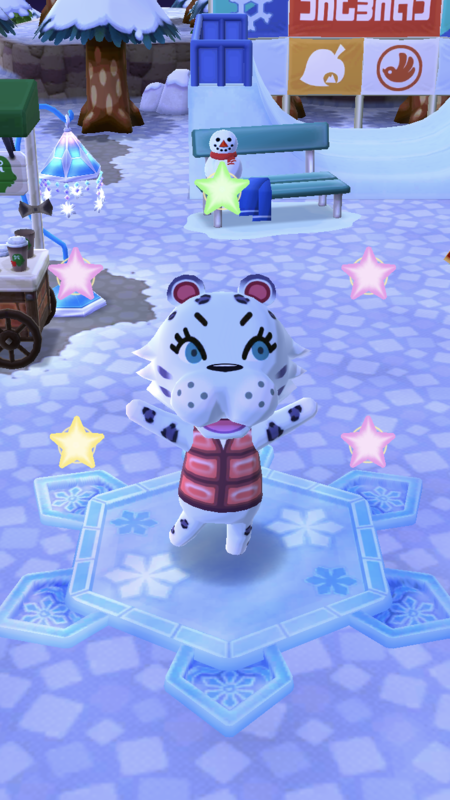 The five new villagers include Aurora (unlocks the Aurora Screen craftable item), Bianca (unlocks Snowboard item), Diana (unlocks Jewelry Case item), Fang (unlocks Mustache Matryoshka item), and Flurry (unlocks Snow Globe item). There are Leaf Tickets to be earned by inviting them to your camp within the next few days, and each will appear in rotation consistently for the same amount of time. Normal Fishing Tourney rules are at play for Tourney #9. Event-specific fish will spawn every three hours, and the sum of the lengths of those caught will earn exclusive rewards. These rewards are super adorable snowpeople with a familiar twist: they’re decorated like Reese, Isabelle, K.K. Slider, Chip, and the Nooklings! I foresee one problem though, as the fish you’re catching are all quite small compared to normal (Horsehair Crap, Lobster, Sweet Shrimp); you may want to invest in the Golden Rod for 80 Leaf Tickets if you’re a completionist like myself. The goals are lower than last time though, so if you fish most/all rounds you should be good to go. There is one surprise in this Fishing Tourney: the return of aquariums! You can earn tanks for each of the event fish. There are three days left for those extra goals relating to new villagers. The current Scavenger Hunt ends at 1 a.m. EST on December 21. The Toy Day Decor event and Fishing Tourney #9 both end at 1 a.m. December 26. And don’t be surprised if at least one Gift-For-All is available in your mailbox over the coming weeks!